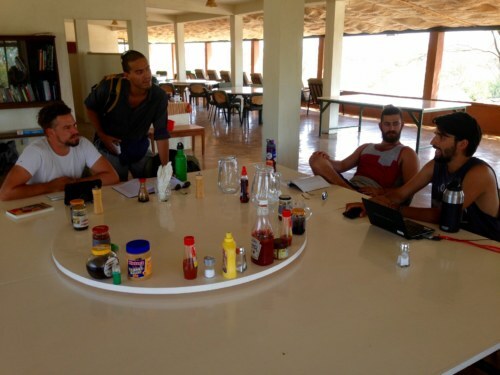 Students have been working on their research projects at the TBI Turkwel campus under supervision of Dr. Jason Lewis. One group of students has been drilling modern and fossil teeth to obtain samples that will be analyzed to examine stable carbon and oxygen isotope ratios. These data help to reconstruct what kind of plants the animals were eating, and if and how their diets changed through time. This in turn will tell us something about the kinds of environments that the associated hominins lived in. 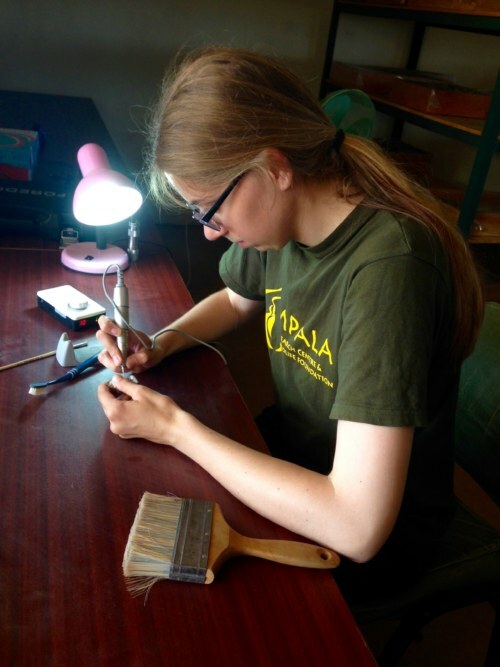 Karolina, Adrianne, Petra, and Sheng have learned how to use the drill to first clean off any cementum and dirt from the enamel surface, to then obtain the enamel sample that can be used for the isotope analysis. Dr. Jason Lewis will use the samples the students obtained for further analyses in the United States. Karolina and Adrianne are prepping some teeth before they obtain the isotope samples (photo credit: Dorien de Vries). Karolina uses the drill to clean off any dirt and cementum on the fossil tooth (photo credit: Dorien de Vries). Another research project attempted to find underground storage organs (USOs) here at the TBI campus. 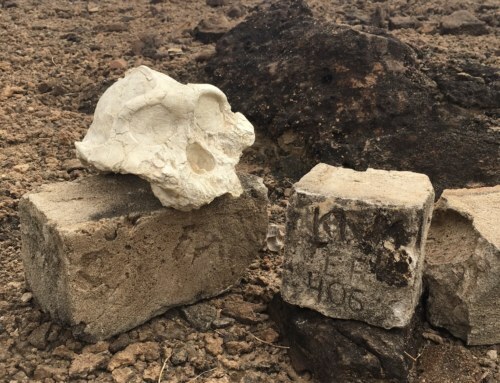 Tubers and roots have been hypothesized to play an important role in hominin evolution, and might have significantly changed the shape of our teeth and the way hominins foraged for food in the African landscape. If this was the case, the isotopic signal in hominin fossil teeth might reflect USOs in hominin diets. However, tubers and roots have not been tested for isotopes yet, and this would be the first step in testing this hypothesis. 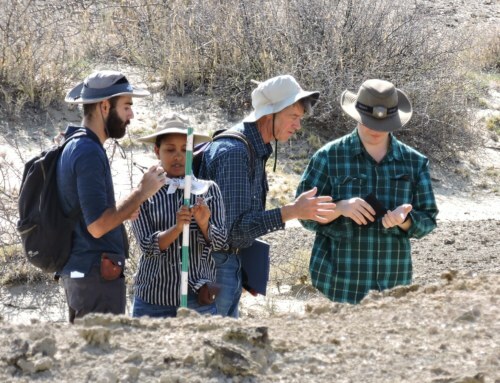 Evan, Ian, Ryan, and Morgan set out to identify plants with tubers around campus by first doing some background research on Turkana flora (with help from Dr. Dino Martins from Mpala Research Center) so they knew what to look for. After a thorough survey of the campus, they did not locate any USOs on campus and had to unfortunately pause this research project for now. But it was a good first attempt! Morgan, Ryan, Ian, and Evan plan their search for underground storage organs (photo credit: Dorien de Vries). The third group, consisting of Nathan and Kelly, used mesowear of a range of fossil mammals to reconstruct the diet, and indirectly the paleoenvironment, of these animals. Mesowear methods incorporate the crown topography (either high or low) and the cusp shape (either sharp, rounded, or blunt) to quantify the amount and type of wear on the tooth crown. These data will reveal whether the fauna at a certain site mainly consisted of browsers (eating soft leaves from trees and bushes), grazers (eating tough grasses), or a mix of both. When comparing the reconstructed diets from different sites and different time periods, mesowear can be used the reconstruct the changes in paleoenvironment through time. With Dr. Jason Lewis’ help, Nathan and Kelly scored numerous teeth for mesowear and quickly learned the importance of careful sample selection and consistent measuring methods. 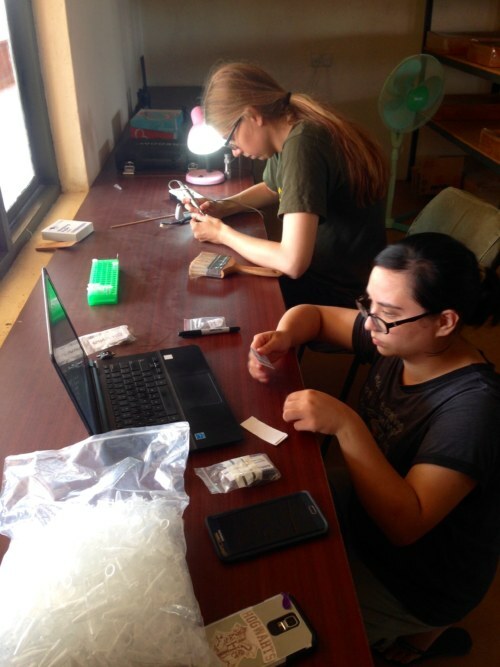 Kelly and Nathan are scoring fossil teeth for mesowear (photo credit: Dorien de Vries). On Tuesday, Dr. Sonia Harmand and Dr. Nicholas Taylor gave a talk on the Lomekwi 3 locality; the oldest archeological site in the world. This is where Dr. Harmand’s team discovered stone tools that have been dated to 3.3 million years ago. 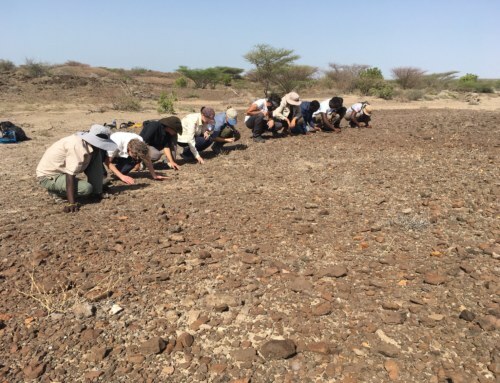 Before this important discovery, the oldest stone tools dated to 2.6 million years ago from Gona, Ethiopia. Dr. Harmand told us about the day the site was discovered, and the important archeological and geological work that has been done in the following excavation seasons. The Lomekwi 3 stone artefacts differ from later stone tools in some crucial ways, and students were privileged enough to be able to hold original Lomekwi artefacts, appreciate their substantial weight and size, and examine them closely while Dr. Harmand and Dr. Taylor pointed out specific characteristics of these artefacts. Drs. 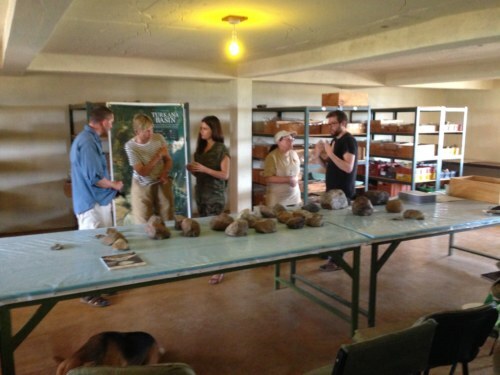 Jason Lewis, Sonia Harmand and Nicholas Taylor talk about the Lomekwi 3 artefacts (photo credit: Dorien de Vries). 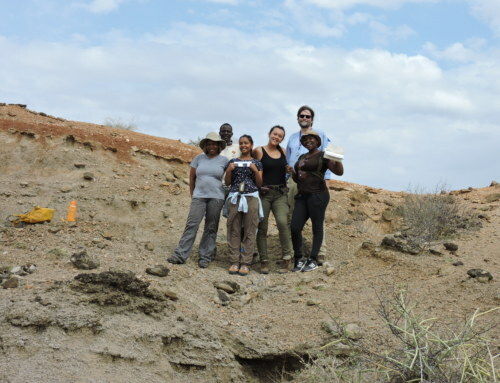 Dr. Sonia Harmand tells the students all about the exciting discovery of the Lomekwi 3 locality (photo credit: Dorien de Vries). 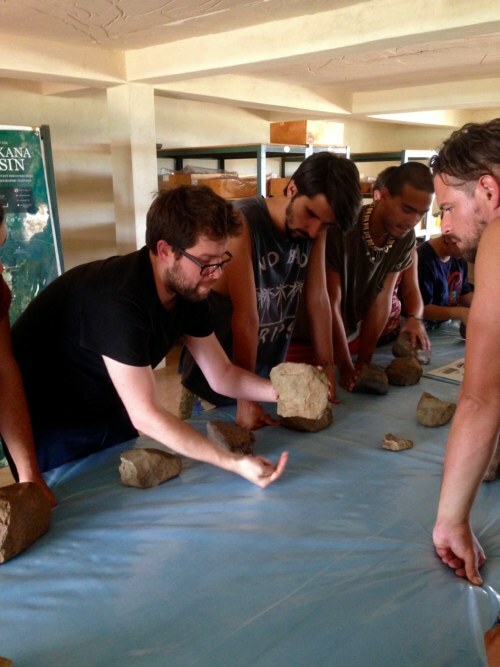 Dr. Nicholas Taylor demonstrates the forces that were applied to produce the Lomekwi 3 artefacts (photo credit: Dorien de Vries). 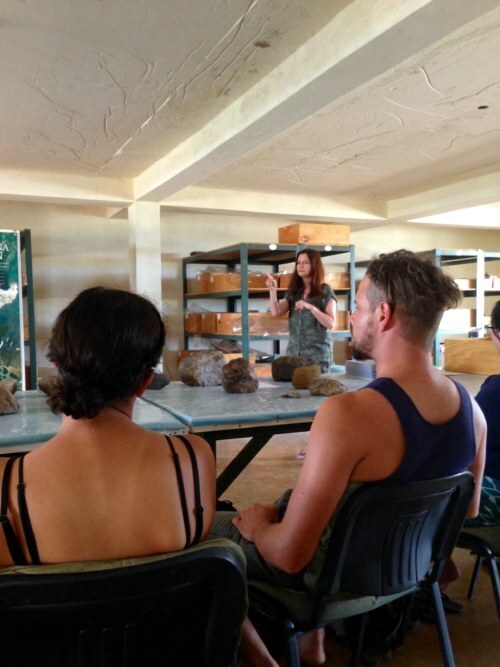 In the coming days, the students will get the chance to do some stone knapping with Dr. Harmand and to learn more about the African Early and Middle Stone Age. 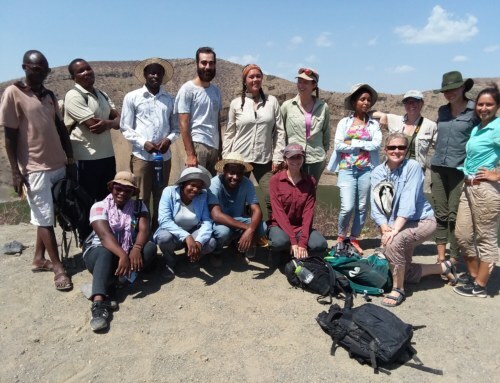 They will also make the most of their last days in beautiful Turkana before flying home at the end of the week!